India, a multicultural country, celebrates all the festivities with a lot of joy and enthusiasm. Starting from Lohri, Diwali to Christmas, there are a lot of festivals that we celebrate all around the year. Similar to all the festivals, Christmas is also celebrated with a lot of enthusiasm. In fact, the fun and colorful celebration are complete without a lavish spread of scrumptious food. Starting from some yummy appetizers to cakes, there is a lot that you can prepare to make this Christmas a special one. Thanks to the availability of a number of smart chef appliances, making your favorite dishes for a party is no longer a problem. So, in this write-up, we list some conventional dishes without which Christmas eve is incomplete. Welcome your guests with eggnog, a creamy and classic drink. Also known as milk punch, the chilled drink is made with milk and egg. To make this delicious welcome drink, you need egg yolks, whipped egg whites, vanilla extract, whole milk, nutmeg, and heavy cream. If you are skeptical about using raw eggs, you can gently cook the eggs to kill any bacteria. Gently cooking the eggs also makes the drink completely safe for kids. If you want to serve your guests some unique starters, baked potatoes are the best option for you. To give a healthy twist, you can use sweet potatoes as these are a great source of Vitamin A, B, C, potassium, phosphorus, and dietary fibers. Bake the potatoes and add some cream, onions, salt, black pepper, and butter. Gingerbread is a must-have during Christmas. As ginger is a warming spice, it in fact used in preparing all the goodies. Most of us buy readymade gingerbread cookies as making them is quite troublesome. 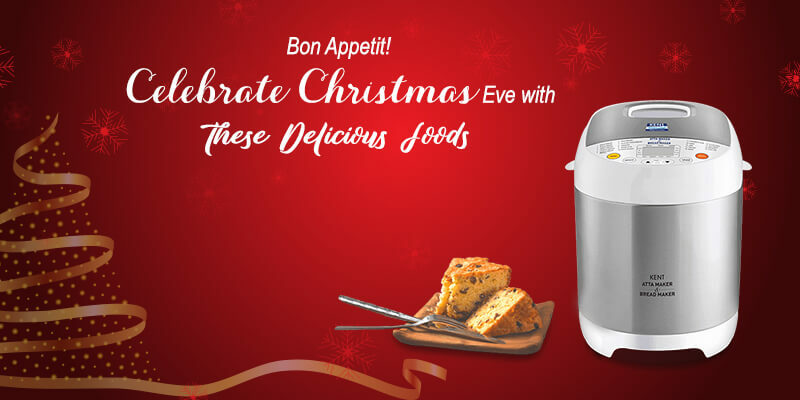 However, with KENT Atta and Bread Maker, you can easily fresh and delicious gingerbread at home. Gingerbread is, in fact, the centerpiece of the dessert section during Christmas. The star of every Christmas party is a plum cake. Made with dried fruits, nuts and a number of spices, Plum Cake is a must-have during Christmas. The nuts and dried fruits are soaked in spirits before adding them to the cake batter. You can easily make this delicious cake using the KENT Atta and Bread Maker. Christmas is incomplete without a bowl of pudding. Also known as plum puddings, the delicacy is made with cinnamon, ginger, cloves, nutmeg, and ginger. You can use the KENT Rice Cooker and Steam Cooker to prepare this yummy pudding. So, what are you Making this Christmas? Christmas is the time of the year to spend some quality time with your family and friends. In addition to the fun and frolic, a lavish spread of food completes the party mood. With KENT Smart Chef Appliances, you can easily make your favorite dishes at home without any hassle.